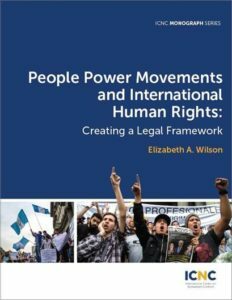 Can People Power Movements Strengthen International Human Rights Law? International human rights law did not come into existence top-down, out of the benevolent intentions of states, even though states eventually began to recognize that large-scale human rights abuses could pose a threat to the international order. Rather, it came into existence from the bottom-up efforts of ordinary people in civil society to ally with each other in solidarity and demand their rights, often through organized nonviolent campaigns and movements that pressured elites and powerholders to recognize individual rights (freedom for slaves, women’s rights, labor rights, and children’s rights, to name a few). Unlike international law generally, the real source of international human rights law has been the coordinated, organized and nonviolently forceful efforts of individuals—in other words, what one can refer to as people power. This webinar will discuss the relationship between people power movements and international human rights and how civil resistance campaigns can further strengthen human rights law. Elizabeth A. Wilson is visiting faculty at Rutgers Law School in New Jersey. She recently served as a Fulbright-Nehru Senior Scholar at the Centre for Policy Research in New Delhi, India. Her areas of specialization include public international law and international human rights law. She holds a J.D. from Harvard Law School and a Ph.D. from the University of Pennsylvania. Please join us on Thursday, Jan. 25, 2018, from 4 to 5:15 p.m. EST for a public discussion on people power movements and international human rights. This event will coincide with the release of a new publication in the ICNC Monograph Series, People Power Movements and International Human Rights: Creating a Legal Framework. The event will take place at the Atlantic Council (1030 15th Street NW, 12th floor, Washington, DC 20005). Early evening refreshments will be served.